There are many knife manufacturers with folding designs that are utilized most of the time for every day tasks that can also be used as a defensive tool in a â€œworst case scenario.â€ On the contrary, there are extremely few folding knives whose primary task is to be implemented as a defensive edged weapon. Spyderco is what I consider one of the top three knife manufacturers on the market today and they have been producing quality products for quite some time now. They have answered this dilemma by working closely with renowned self-defense instructor Craig Douglas (SouthNarc) and his company ShivworksÂ to produce the Spyderco P’Kal. Adding to its many distinct features, the blade on the Pâ€™Kal is extremely specific to its purpose, which is to rip your threat’s extremities if situation dictates. The blade is a modified Wharncliffe so as to enable the blade to be somewhat â€œclaw-likeâ€ in fashion. There is also an extreme point designed into the blade so the user is better able to penetrate whatever is necessary in the context of a violent encounter. As with some of the Spyderco line, the patented Emerson Wave is designed into the blade. Instead of the typical over pronounced hook that is used with all of the Spyderco folders that use the â€œWave,â€ on the Pâ€™Kal itâ€™s made into a solid post that is removable if the user desires. Pulling the blade out of the pocket with a positive action will lend the Wave to stick on the users pocket and deploy the blade in an extremely fast and efficient motion. The handle as well as the overall ergonomics of the Pâ€™Kal is very particular in nature, the knife is primarily designed to be held in the less known â€œreverse grip, edge in.â€ This usually comes as somewhat of an awkward type of grip, especially for people with no formalities in the aspect of edged weapon instruction. The user must understand that in the context of an extreme close quarters (ECQ) situation, using traditional forehand strikes that can only really be used if you have space, do not exist in an ECQ situation. Instead, with a reverse edge grip you will be hooking and pulling with your Latissimus Dorsi in your back, which is a gross motor skill and extremely strong. Especially if the user doesn’t have space and can only drive the point of the Pâ€™Kal into the threat, having the blade in a reverse edge is extremely viable. There is also no extended pommel (bottom of handle) that will stick out so that the user can get a firm, tight grip on the knife. 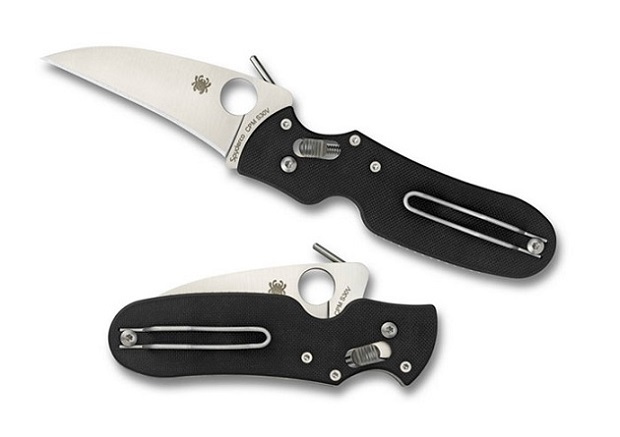 The locking mechanism is only found on a few of Spydercoâ€™s many products. Spydercoâ€™s Ball Bearing Lock sits above and behind the blade, is housed in a piece of plastic and is accessible for both left and right hand opening. It is one of the strongest of Spydercoâ€™s designs lending itself to a smooth opening and firm lockup each and every time. The clip found on the Pâ€™Kal is a very simple wire clip that lets the folder sit nice and deep in the pocket, but is still very accessible. It is only available to be attached with tip up and left or right side pocket carry. I have bent mine on occasion by accident, but unscrewing it and bending it back straight is a quick fix. The Spyderco Pâ€™Kal is a great purchase for someone that is willing to get proper edged weapon instruction as well as understanding the proper context of what its designed for. This is not a knife designed to open boxes, it is designed to be used as a lethal tool in a â€œworst case scenario.â€ I would highly recommend if the user wants practice with the Pâ€™Kal seriously, purchase the trainer as well. It is an extremely efficient folding knife that fits very comfortably in the hand and has amazing craftsmanship. Craig Douglas of Shivworks and Spyderco put a lot of work into this quality folding knife. Ian Strimbeck is a veteran of the United States Marine Corps, where he conducted training for host-nation forces in small-unit tactics as an Infantry Rifleman. During that time, he attained experience in combat and security operations, and was in multiple high-tension environments. He deployed twice, once in support of OIF and the other in support of the 22nd MEU (Marine Expeditionary Unit). Ian is a certified Combat Focus Shooting Instructor, NRA Basic Firearm and Massachusetts State Police Firearms Instructor, certified Glock Armorer and certified Fit Shot Instructor. He works executive protection services for Resolute Security Group, and writes for the Personal Defense Network. He is also a founding member of the Association of Defensive Shooting Instructors. Same thing has been done with zip ties. Just Check out YouTube. They’ve designed entire knives around the P’kal concept “done with zip ties.” Thats pretty special sir.